On-The-Job Deaths Spiking As Oil Drilling Quickly Expands As baby boomers retire and drilling increases, energy companies are hiring, adding 23 percent more workers between 2009 and 2012. But the hiring spree has come with a terrible price: Last year, 138 workers were killed on the job, twice as many as in 2009. Energy companies are adding workers, but fatal accidents are on the rise, too. Blue-collar workers, hit hard by automation and factory offshoring, have been struggling to find high-paying jobs. One industry does offer opportunity: As baby boomers retire and drilling increases, oil and gas companies are hiring. They added 23 percent more workers between 2009 and 2012. But the hiring spree has come with a terrible price: Last year, 138 workers were killed on the job — an increase of more than 100 percent since 2009. In fact, the fatality rate among oil and gas workers is now nearly eight times higher than the all-industry rate of 3.2 deaths for every 100,000 workers. And none of that is happening in an air-conditioned office. "Much of the work that goes on in the industry is done outdoors regardless of the weather," Hill says. Earlier this year, the Bureau of Labor Statistics issued a report saying oil and gas extraction deaths hit the highest level in 2012 since the government began compiling that data in 2003. "Job gains in oil and gas and construction have come with more fatalities, and that is unacceptable," Labor Secretary Thomas Perez said in a statement. "No worker should lose their life for a paycheck." But those deaths can rise with hiring binges in the energy sector. In 2006, when the economy was strong and oil prices were soaring, energy companies started hiring rapidly, increasing the workforce by roughly 9 percent to 139,400. Amid that rush of new, inexperienced workers, deaths spiked nearly 28 percent to 125 for the year, up from 98 deaths in 2005. One of the people killed in 2006 was Chuck Lindstrom. 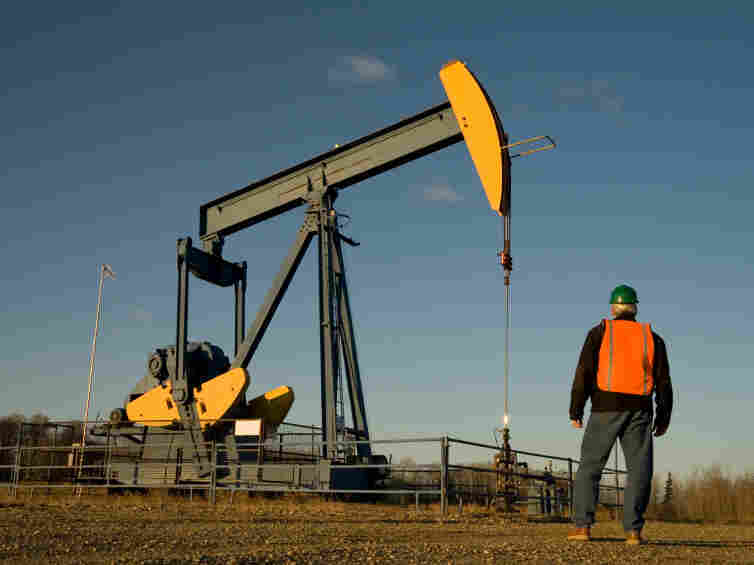 The 57-year-old mechanic was working in the Bakken Shale formation in North Dakota. He repaired pump jacks — those horse-headed machines used to draw crude oil out of the ground. On a hot day in mid-August, Lindstrom phoned his wife to tell her he'd been called out on a job and would be home for lunch. But when the sun set that evening, Lindstrom still wasn't home. His son, Cody Lindstrom, described what happened next when his mother checked with the company about her missing husband. "They began looking, and eventually by around 11:30 at night, the sheriff was contacted, and that's when they went out to the site and they found his truck there," he says. Cody Lindstrom says his father climbed inside a safety fence around the pump jack to make his repairs. He'd just finished his work when the pump jack started up. "From what we've deducted, his arm got pinched between the frame and the hammer when it came down, and it pulled him into the machine," Lindstrom says of his father. The 2006-'07 surge in fatalities reversed itself when the Great Recession hit and everything slowed down. In fact, in 2009, the industry's workforce shrunk about 6.6 percent. As companies laid off less-experienced workers, the death rate plunged nearly in half. In that recessionary year of 2009, 68 workers in the industry died. Now a new hiring surge is in full swing, thanks to a technology known as hydraulic fracturing, or fracking. The drilling method is producing a bonanza of oil and gas. Young workers are putting in long hours, and some critics say the companies should be doing more to test workers for drug use. Companies are required to test employees before they're hired and regularly afterward. Back in 2006, her husband, Charles Mannon, was working for Cheyenne Drilling in Saginaw, Texas, near Fort Worth. Mannon was up on an oil derrick at 3:30 a.m., when a pipe swung around and knocked him off, killing him. Clark says she sued the company, but her lawyer dropped the suit when Mannon's body tested positive for methamphetamines. Clark says she is now married to another oil field worker, and in this latest hiring boom, she has seen little vigilance to make sure workers are clear-headed. "My current husband has been with a company five years, and he's only been drug tested once," she says. "I mean, to me, there needs to be a lot stronger drug testing, because, you know, one person out there that's on drugs can kill a whole crew. You know, a blowout could happen or — the possibilities are endless." The Occupational Safety and Health Administration says it is ramping up enforcement of all rules and regulations for the booming oil and gas sector. And the industry is cooperating, according to Kenny Jordan, who heads the Association of Energy Service Companies, a trade group based in Houston. "All of us, from an industry standpoint, we need this to be a safe place to work," Jordan says. "We have a shortage of people now, and we need people to work here, and we don't need our industry to have a bad reputation in terms of we're turning a blind eye, or we're not doing anything about the issues," he says. But Cody Lindstrom, reflecting upon his father's death and his own brief job stint in the oil fields, says that with so much money to be made in the energy sector, both companies and workers are in a hurry, and they may be putting too little thought into job safety. "Time is money when you're out on the rig," he says. "And that's where the safety concerns come in." NPR intern Rachel Quester contributed to this story.